Half a million Britons bought a gray car last year - and in 2018, according to the Society of Motor Manufacturers and Traders (SMMT), it was the most popular car color for the first time. Silver experienced its heyday at the beginning of the 2000s and was at the top every year between 2000 and 2008. In 2018, however, it did not even reach the top five places. But is there really a difference between gray and silver? Silver is only metallic gray, right? It's not like that in the car world. The second most popular car model of the past year, Volkswagen Golf, is available in "Graumetallic" and "Silbermetallic". A company spokesman explained that many of their colors are just translations of their German equivalent. All newly purchased cars will be registered with the DVLA - and the color will be recorded according to the car manufacturer's description. However, this is not enough to distinguish between cherry red and scarlet - in the eyes of the DVLA both are only red. So why the difference between metallic gray and silver? A Nissan spokesman who offers his Qashqai a "Gun metallic" and "Blade Silver" finish said, "Silver aims to replicate the finish of silver and metal, while gray is the color gray." What are the least popular car colors? Black, white and silver have been favorites since the turn of the millennium. But of the colors that were perceived as less aesthetic, chestnut brown was the least popular choice last year, only 471 of such cars were admitted. Not far behind was the cream with 559 applications. Third was the most unpopular Pink, who was no longer popular with ex-glamor model Katie Price. She tried to sell her Barbie Pink Jeep after being banned from driving earlier this month. Fourth went turquoise with 1,824 new registrations and fifth gold with 2,919. Is a white car cheaper to insure? There are rumors that dark cars have higher insurance premiums. 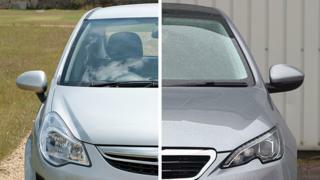 It is believed that lighter and brighter cars are easier to see and therefore cause fewer accidents. But on the MoneySupermarket price comparison website, customers are not prompted to provide vehicle color. The reason? "It's easier for a bad driver to change the color of his car than the quality of his cornering!" said a spokesman. If you fancy color, you must inform the DVLA. Lee Griffin, president of GoCompare, said several studies have looked at the correlation between car color and accident rate. "British insurers, however, do not take color into account when setting premiums because statistics are too unreliable," he said. "They focus on your age and driving history, as well as the type of car you drive, which are all better indicators of your insurance risk."